Toddler Approved! 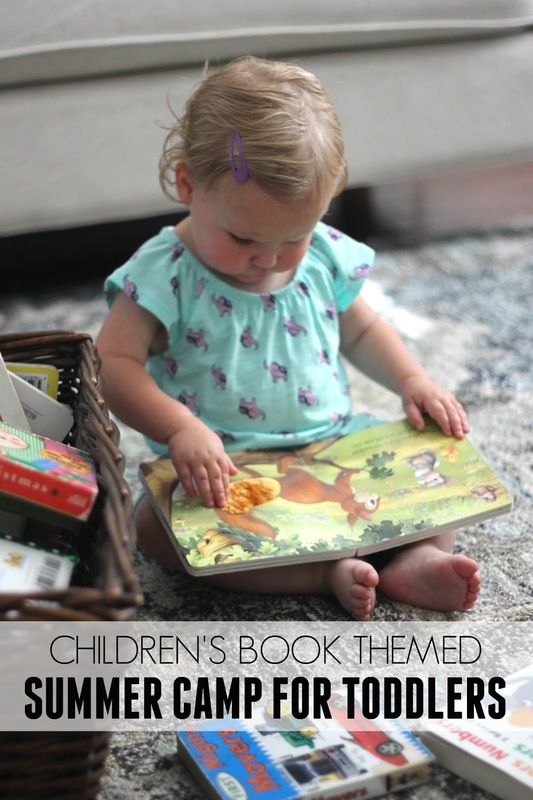 : Book Themed Summer Camp for Toddlers! Book Themed Summer Camp for Toddlers! Each summer we spend time day-tripping, traveling to visit family, and having fun at summer camp! When my kids are 5+ they usually get to spend a week or two attending local science/arts based day camps (like Camp Galileo). Before they are old enough to go to day camp, we always host a camp mom and a few weeks of Virtual Book Club Summer Camp! This year is especially exciting because I am the Camp Director AND Toddler Specialist at our VBC Summer Camp! 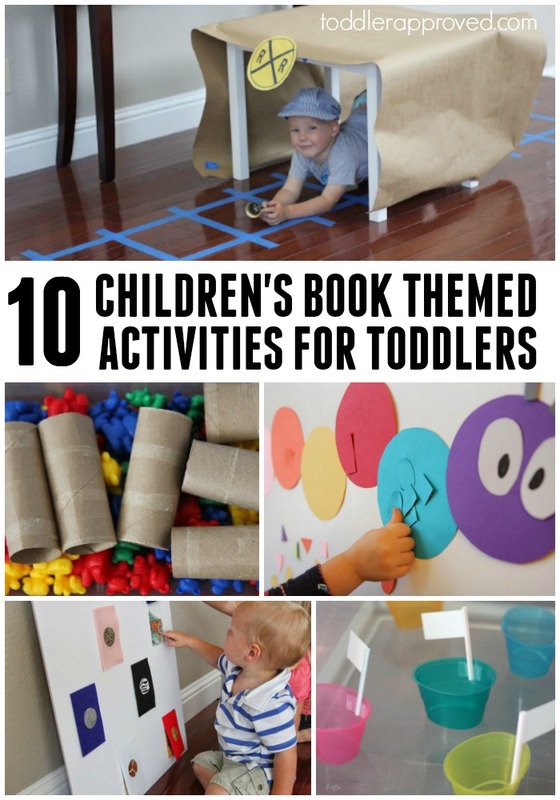 I'll be sharing 5 toddler activities each week and fun toddler-friendly book lists! This is different from past years when we just shared general activities for kids ages 2-5 with a few suggested modifications for younger kids. Kim from The Educators' Spin On It will be sharing ideas for kids ages 3-5 and Cerys from Rainy Day Mum will be sharing activities for kids ages 6-9. All activities will be adaptable for all ages though! It will be awesome! Our early bird discount ends today, so don't miss out!! Me and my 2-year-old month old (along with my 10,7, and 5-year-old) will be putting together some super fun activities to go along with our camp themes this year! 1. First you need to register for summer camp! If you register on or before Monday, April 16th, you can get our special Early Bird Price! Camp lasts three weeks (June 11th, 18th, and 25th) and we have a different theme for each week! As the toddler specialist, I will not only share fun toddler-friendly activities for each week, but I'll also be on hand in our Facebook group to provide additional resources, share toddler tips, and answer questions! 2. Once you register, you'll be sent an email with our three camp themes and an invitation to join our secret and awesome Facebook group (mentioned above). 3. In May you'll receive our pre-camp planner with book lists and supplies to help you get ready for camp! 4. On Friday, June 8th (maybe even sooner) you'll receive all of your digital materials for your first week of camp! Camp starts on Monday, June 11th! Your second week of materials will be sent on Friday, June 15th and third week of materials will be sent on Friday, June 22nd. Materials will include daily activities, field trip ideas, a few bonus activities, and printables! If you love children's book related crafts and activities, here are a 10 activities that you can try over the next few weeks leading up to camp to get you excited!!! This list contains Amazon Affiliate links! 2. Make a bear sensory bin and bear mask and read Brown Bear Brown Bear by Eric Carle. 3. Do some train pretend play and read Freight Train by Donald Crews. 4. Build tunnels and drive cars while reading Goodnight, Goodnight Construction Site by Sherri Duskey. 5. Make a Zoo Animal Peek-a-book board and read Dear Zoo by Rod Campbell. 6. Play a baby animal movement game and read Moo Baa La La La by Sandra Boynton! 7. Do caterpillar color sorting (or destruction) and read The Very Hungry Caterpillar by Eric Carle. 8. Make a paper plate painted owl and read Peek A Who? by Nina Laden. 10. Create an alphabet sticky wall and read Chicka Chicka Boom Boom by Bill Martin Jr.
Don't miss out on our Toddler Book themed summer camp! Your bigger kids can join in too! Find our more details about our book themed camp and REGISTER HERE.